Another post in honor of World Breastfeeding Week! Remember to keep baby Visible and Kissable (TM), especially when nursing baby in your carriers. 1. 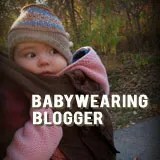 Babywearing and nursing are independent skills, best established separately before combining. *Established nursing means nursing without positioning props, aids, etc. and latch is well-established. *Established carrier use is being able to use and adjust your carrier independently, safely, and confidently. 2. Babies nursing in a carrier must always be brought back to upright and tight positioning. 3. Baby’s face must always be visible in the carrier, even when nursing.